For my next project I intend to make the track using copper-clad sleepers. Since the sleepers will be hidden I don't really care what they look like or what size they are. However my stocks of copper-clad strip have depleted, and it is not the sort of thing you can pick up in a local model shop! It can be bought by mail order but generally comes in packs of 20' (not as one length of course! ), which works out quite expensive when you consider I probably need about a quarter of that. I managed a trip to Squires last month (the wife needed something from Bognor so I took the opportunity!) and amongst a pile of bits and bobs I got a sheet of copper-clad board for about £1.50, thinking I could cut it into strips. However it proved resistant to all known knife blades - this is tough stuff! Then it struck me - rather overkill but perhaps the power jigsaw could be used? But how to cut a small, brittle board with something as large and crude as a jigsaw? The photo shows how. The copper-clad was screwed face-down to a piece of board (more of that PVC plastic I got for free in this case), which could be held on the bench, and support the board during cutting. In the end I put the screws into the bench too! 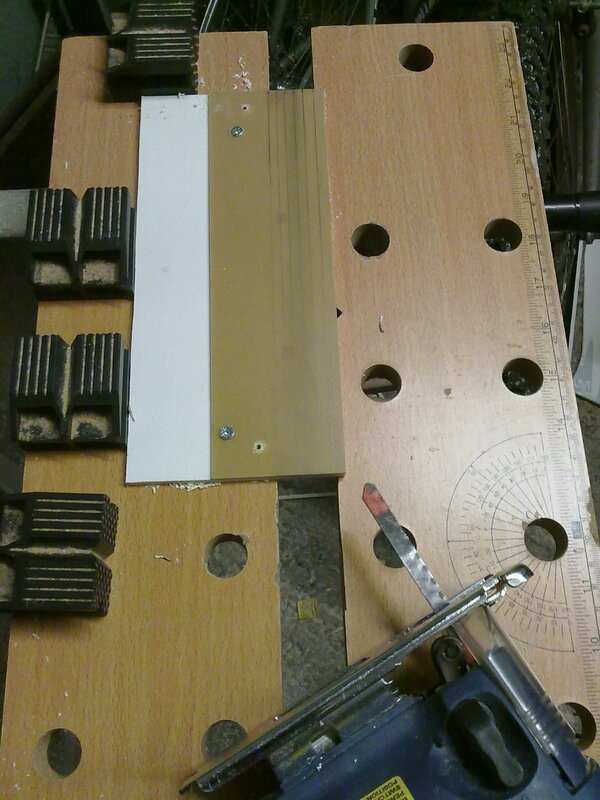 I managed to cut a dozen strips - not very straight or even, and a bit rough, but fine for my needs - plus the last bit can be cut into larger slabs for board and cassette ends. Sledgehammer and nut? Probably! But it worked. Although I measured out for a double track, for now I am sticking with the basic oval and siding that comes with the Thomas set. After all, for now Thomas will be the only train! The point is I will be able to add an extra track, and more sidings, later on. 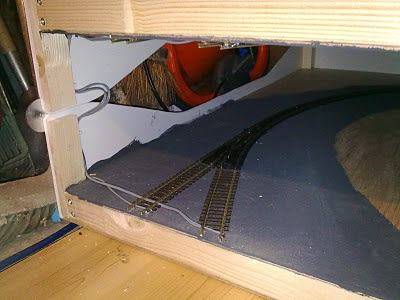 First I painted the track-bed grey with a couple of tester pots from the DIY store (allowing for future track). The track was stuck down with No More Nails (I thought it might be stronger than PVA but it didn't dry clear, PVA would have been better) and pinned, althoug the track pins were reluctant to go through the ply! At the board edges I used a short length of nickel-silver flexi-track, where the rails crossed the joint I put in brass screws both sides, and then soldered the rails to them, then cut the rails. This should make the track robust at the edge and ensure precise alignment, even though it is cosmetically lacking! Each rail then had a wire soldered to it, running over the hinge post to the rail on the other side, ensuring electrical continuity. The photos should make this clear. 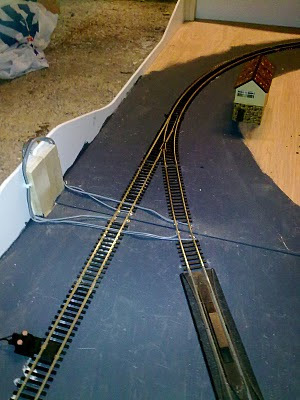 The Hornby controller was screwed to the board in one corner and connected up. In the siding I added a re-railer ramp with uncoupler, I'm surprised Hornby don't include these in the train set. I know they are not pretty but for a child they are very useful! A set of Hornby platforms were cut to fit the board joint and the length of the straight and stuck down with a glue gun. I used the small station building as although I have the larger one, it fouls the other end of the platform when the board is folded! I also found a signal box, this and the station came from my parent's loft ... Finally more tester-pots were used to paint the rest of the board a rather un-convincing grass green, I threw some handfuls of scatter onto the wet paint too. Frankly it hasn't worked that well but it is better than bare ply, and this is just a train set! It can all be spruced up over time. The real test came today, my Son's 4th Birthday. Even with lots of other presents including Playmobil (which needed a surprising amount of assembly!) and Firman Sam toys (which he is mad about), he was really excited when he opened the big parcel of the train set! Then I produced the board and he set to playing trains. In fact I have spent a significant part of the day kneeling on the floor playing with him - apparently I am the Fat Controller! Clearly it has been a big hit. So does the board work? Well yes, although I really should get some handles to make moving it about easier. 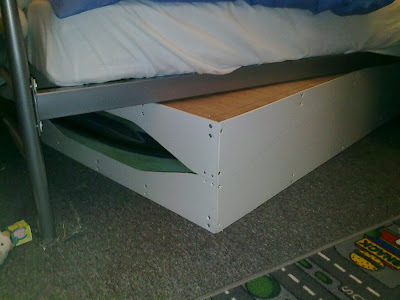 As you can see though - it does fit under the bed as intended! It is really easy to unfold and plug the controller in, so can be up and running in a couple of minutes, so mission accomplished! We woke to about 8 inches of snow yesterday morning. Since we live very close to the Channel this is most unusual, and is the most snow I have ever seen in this part of Sussex. Mind you, given the last couple of winters it seems to be getting more common! 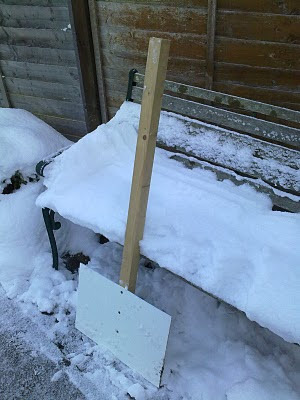 I had been meaning to get a snow shovel, but of course never got around to it. So while in the village my wife popped into the local hardware store; they had sold out, but they were selling what she described as boards of wood nailed to posts! I suspect they had been very enterprising and making their own in the timber store next door! Well my wife though I could do that myself, so I did! The board is some of that foamed PVC I got from the marketing department at work, the handle a leftover piece of 2" square softwood. OK it is not exactly ergonomic or pretty, but it is surprisingly effective at clearing the path and drive! If you are interested in model railways, particularly in narrow gauge, or small (micro) layouts, then I hope you will find this site interesting. I try to update it periodically with news of my current models and layouts, and anything else model-railway related (and sometimes not!). I usually model in 009 scale (1:76 or 4mm/ft using 9mm gauge track), although I have recently dabbled in 014 (1:43 or 7mm/ft on 14mm gauge track) as well. For more on my current and past layouts click the the links to the pages below. If you have any comments or feedback, do let me know! I have been building model railways since I was a teenager, mostly in 009 scale though I have also worked in 00, and more recently 014. I am a member of the 009 society (which is highly reccommended if you model in 009 or similar) and of the local area group of the society in Sussex, the Sussex Downs group. Away from model railways, I am a chartered engineer working in the automotive industry, I am married with two small children to occupy most of my free time, and I am involved in the PA and technical things at my church. So I don't get a lot of time for model railway building! Need an accountant? Try my sister! Project no.1 - Work begins! Riverside Yard and other layouts - and interactive shunting puzzle! Picture Window theme. Theme images by PeterJSeager. Powered by Blogger.